– Dr. 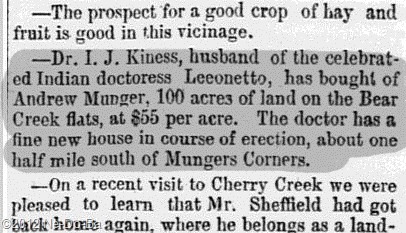 I. J. Kiness, husband of the celebrated Indian doctress Leeonetto, has bought of Andrew Munger, 100 acres of land on the Bear Creek flats, at $55 per acre. The doctor has a fine new house in course of erection, about one half mile south of Mungers Corners. Thanks to the local news column in the newspaper, I understand how Leeonette connects to the Kanistanaux family. She is married to Laton’s brother, Isaac. Of course, she may still be related to Marleah as well. Isaac in using his birth name of Kiness in June of 1874. One year later, in June of 1875, his brother Laton and Marleah are living here using the Kanistanaux name. There was a doctress using the name perhaps as early as 1866 and certainly by 1870. At this point in the project, it appears the doctress was the earliest to use the name. But which doctress was it? A little research might turn up a town map from the general time period and I might just be able to pin point exactly where this property is and what the neighborhood was like at that time. I also need to investigate the county land records for all transactions by any member of the family. I was on a lucky streak, because shortly after discovering the above news item, I found two more related to this same event. – Kiness, the Indian who bought a farm of Andrew Munger, commenced the erection of a nice house and made a big splurge generally, is said to be busted finer nor a barn. It appears the house is built by early September and Isaac has spent a great deal of money. The town reporter is poking fun at the “Indian” by suggesting he has overspent his finances and has nothing left to build a barn. I find it is necessary in this type of research to get to know the local attitudes and how they probably affect what is being reported in the local papers. The best way to do this is to read the local newspaper, lots and lots of pages of the local newspaper. Two Seneca Reservations are located nearby and the “white folks” of the region seem to enjoy poking fun at their neighbor “Lo, the poor Indian”. They love to tell how poor “Lo” got himself cheated out of his money or did something else they deem foolish. – Leonetto, the Indian doctress and Kiness her husband have gone to Canada, “on a visit”. It is thought here that the visit will be a long one. Ten days later, the reporter tells us Isaac and Leonette have left town on a visit. The reporter is suggesting they have skipped town, never to be seen again. I see an entirely different picture then the reporter did. What I see is this. As soon as a house was ready, they left to get the rest of the family in Canada. It appears the reporter’s suspicions were unfounded. They did not stay in Canada long, because Catherine Moulton (Marleah’s presumed mother), died just 6 weeks later in Stockton on 3-Nov-1874 (still needs to be verified). At the time I retrieved my copy of the 1875 Census for the Kanistanaux family, I had the researcher check for other Native families in town that year. She found no other “Indian” families. At that time, I did not know I should also be looking for the name Kiness as well. In light of this new land information, a second look at that 1875 census should be made to see if Isaac and Leonette were there and listed as white. A serious look at the land records may turn up even more pieces of the puzzle. And, most likely a bunch of new questions as well. That certainly seems to be the way this project flows. So, now I know Leonette was married to Isaac. I wonder what town I will find that marriage record in?